The nose is an interesting mixture of known and unknown aromas – a clash of worlds – literally, as Scottish peated barley malt is distilled, matured and bottled in India. The peat is there – not nearly as prominent as in most Islay whiskies it is Highland style peatiness to a level we’re used to seeing in, for example Springbank (maybe a little less). It’s there – but just one flavour component amongst many. So, we’ve got the peat covered, what else is there to detect? Well, it is not an in-your-face dram, a bit shy at first. A malty honey sweetness sets the base and on top of that there are cloves, cinnamon sticks, chocolate cake, sweet whipped cream, rubber, caramel, fudge and a hint of molasses and dust. The palate opens on the herbal, salty and dry side with the alcohol being more noticeable than on the nose. After a few seconds a malty background sweetness creeps in making it a mixture of light-ish cough lozenges. Very tightly packed together. With a dash of water: Sweeter! Orange juice, orange rind, cinnamon sticks, vanilla pudding, milk chocolate, but also tannins, freshly cut grass, fragrant hay white pepper and hot peppers. Oh, wait a minute, where’s the fire, I mean, peat smoke? It is there, a note of cold peat smoke, lingering in the background mixing in with all the other notes, but it’s fairly subdued. The finish has cold smoke with herbs, spices and a background malt sweetness, medium long with some oak notes appearing at the end. The Indian market for whisky is enormous, but most of it is made up of distilled molasses – stuff “we” wouldn’t even dream about calling whisky. 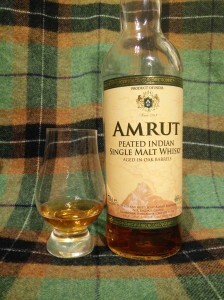 But there is also Single Malt Whisky to be found in India and Amrut is probably the best known in the western hemisphere. They usually source their barley from India but in the case of this (lightly) peated version the malt is shipped in from Scotland. Worthy of note is the fact that Amrut whisky matures very quickly due to the hot climate in Bangalore, where the distillery is located, with the Angel’s share reaching staggering 10% and more. This also matures the spirit much more quickly and differently than in Scotland with its much colder climate. In the end you’re getting a distinct, unique product. It has many qualities we know from Scotch Single Malt, but with a twist – you can taste the spices of India in this dram! Addendum: Between writing these tasting notes and publishing them I also had a chance at tasting batch #22/2013 at a tasting in Salzburg. While I wasn’t able to compare them side-by-side, batch 22 was noticeably more smoky, otherwise the flavour profile was the same.